More friends and a blog: C'mon, admit it...you liked them too. C'mon, admit it...you liked them too. As often as not, when my folks visit me, they bring me some "old stuff" to go through or get rid of. They have been downsizing for many years now, and it often means that a lot of...ahem, treasures end up finding their way here. A sort of de-junking pass the buck, as it were. Just lately they have been sorting through all their LPs (now don't get excited, Samantha, they are keeping their Elvis ones). They found these ones in their collection and realized that they must've belonged to me. And have a look, this one opens up for more close up viewing. Oh my!! Oh, you might as well just admit it, you loved them too. I know it! I showed them to Samantha a few days ago, and after she left I felt I better check and make sure they were still where I had left them, it occurred to me that she might have made off with Shaun. :-) Now, I am going to go post about the other goodies - the handmade goodies- over here. 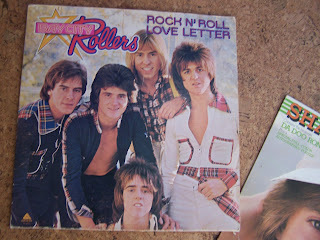 Oooh, I DID love the Bay City Rollers - do you have a record player? I want to hear them sing!!! 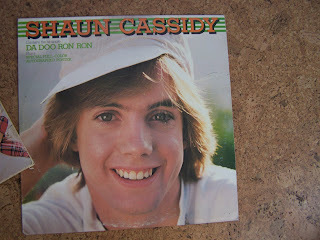 PS - I loved David Cassidy too - not Shaun. Wow...I had those two albums too...I think I may have even practised kissing on that Shaun Cassidy one...eek! He was dreamy wasn't he? 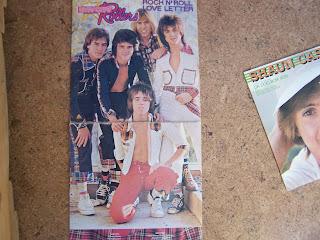 And oh yeah, you had to love the Bay city Rollers! Oh fun! That takes me back. So have you been playing these records, Heather? I still have both of those albums and also now have them on CD. It's amazing how easily the words come back to you so that you can once again sing along.